Every successful remodeling company needs a clear paper trail. With this manual, you can use my already tested and proven internal documents for administration, sales, and production to enhance whatever forms you’re currently using in your office. 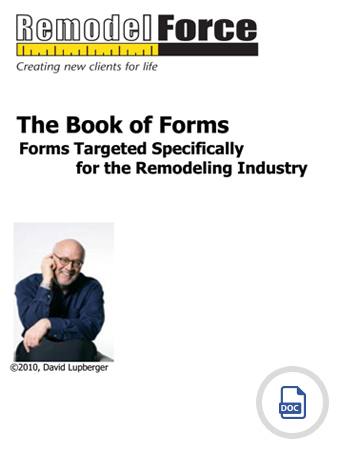 Book of Forms includes dozens of forms, any one form could be worth its weight in gold to you. Every successful remodeling company needs a clear paper trail. With this manual, you can use my already tested and proven internal documents for administration, sales, and production to enhance whatever forms you’re currently using in your office. Book of Forms includes dozens of forms; any one form could be worth its weight in gold to you.